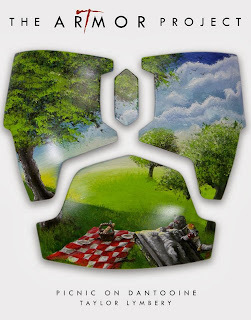 Taylor's Sweet Little Art and Nerd Site: Painting of the Day- Picnic on Dantooine! Painting of the Day- Picnic on Dantooine! Not too long ago, I was approached to make a couple of art pieces for a new program called, "The Artmor Project". This is a new program created by the guys over at NeoZaz.com. The program is sixty Star Wars Artists, Podcasters, Fans, and Community Pioneers who were sent blank Mandalorian armor sets to create custom one of a kind pieces of Art. These original works will be auctioned of as the corner stone of the annual Star Wars in Character Star Wars Toy Drive benefitting Toys for Tots. I am a big fan of Toys for Tots and couldn't pass up this grand invitation! This was the first piece that I finished. It is called, "Picnic on Dantooine". You can also see this piece in my deviantart gallery here. I will have a table for the Dallas Comic Con: Sci-Fi Expo, February 8-9th. If you are wanting a pre-Sci-Fi Expo commission, let me know and I'll get it ready for pick up at that show. All throughout the month of Movember, I'll be continuing to grow my mustache to raise awareness of prostate cancer and I'll be taking donations for the Prostate Cancer Foundation. Do you want to donate?! Head on over to my Movember page and donate! Custom Toy of the Day- The Sentinel! Post Dallas Comic Con: Fan Days 2013 Fun!